Updated: 8:25 p.m. | Posted: 5:17 p.m. Fare evasion on Metro Transit's light rail lines may have doubled in the last two years in some areas of the service. That's according to a new audit estimating how many people are riding without valid proof of paying. It heads for the Metropolitan Council's audit committee on Wednesday. The audit estimated fare evasion at between 7.6 percent and 11.8 percent on the Blue Line from downtown Minneapolis to the airport and Mall of America, up from 2.6 percent to 3.6 percent in 2014. The report called that "statistically significant." 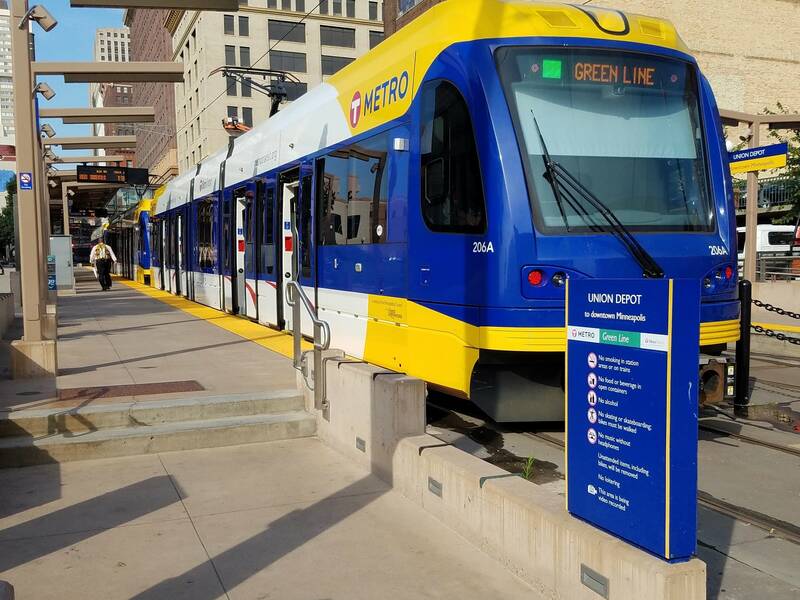 Evasion on the Green Line, which opened in 2014 between the downtowns of Minneapolis and St. Paul, rose from between 4.6 percent to 9 percent in 2014 up to between 8.4 and 10.8 percent this year. Night trips on the Green Line and midday trips on the Blue Line were particularly subject to fare evasion, the audit found, topping 15 percent in some cases. Fare evasion on the Blue Line is thought to be highest in downtown Minneapolis. The Green Line evasion is thought to be highest between the Western Avenue and Snelling Avenue stations. The audit had people checking with riders on 25 randomly selected train trips. "The big thing about this audit is, is there something we can learn from it? Can we look at it? Can we inform some of our policies and procedures to respond to it. That's the important thing for me," said Metropolitan Council chair Adam Duininck. Metro Transit spokesman Howie Padilla noted that there were some increases that may be attributable to differences in the studies. The report matches a 2014 study that uses a "stratified cluster sampling" method that checked riders on 25 randomly selected rail trips. But Padilla notes they were also done in different parts of the year. The latest findings also follow a change of policy by Metro Transit police. Following a statistical analysis by the department that found racial disparities in enforcement, the department changed its response to first-time fare evaders. The new policy has officers giving them a warning, rather than a citation. The fine for fare evasion is $180. "The substantial increases in fare evasion on the Blue Line may be the result of the publicity surrounding the change of fare enforcement policy by Metro Transit Police," the audit said. "This policy change could have made some riders more willing to risk riding without proof of payment." It also suggested that a ramp up by police in 2014, before the Green Line actually opened, may have temporarily heightened enforcement and depressed fare evasion on the Blue Line before officers moved onto the Green Line tracks. The increase comes despite what Metro Transit is calling a step up in fare checks — on pace for about 2 million this year, up nearly 49 percent from 2014, the study found. Padilla said Metro Transit police officers aren't finding the change reported in the audit. "What they've seen, taking it from January all the way through and all various times of day and night, their compliance rate of the people they've checked is in well into the high 90s," he said, "and in some cases above 99 percent." The audit says that Metro Transit police should implement a program to better track fare evasion. The police department also said in response to the audit that it has experimented with adding more non-uniform police to enforcement efforts, as well as non-sworn community service officers. The study comes at a particularly contentious time for light rail. The Southwest Light Rail Transit project helped bring a political stalemate at the Capitol, and opponents have been highly critical of some transit projects' "farebox recovery" — the share of the cost paid by riders. Duininck said the audit doesn't mean the state should table light rail projects on the drawing board, like Southwest and the Bottineau line. "Fare evasion whether people are stealing rides on MnPass, in their car, in the MnPass lane when they shouldn't be, just as much as it happens people hopping off and on light rail vehicles. It's something we want to address, and we're going to do everything we can to stop. I also think it's not a reason not to expand the transit access in this region." The audit also notes that Metro Transit's fare evasions are not inconsistent with other comparable transit agencies, where they range from 5 to 15 percent. Plus the cost of fighting evasion may not be worth the return, the audit's authors said. "As we reported in 2014, and others have reported in the past, even systems that have built barriers to entry continue face the problem of fare evasion, as passengers can hop over turnstiles or evade paying in other ways," the audit said. "The very high cost of purchasing, installing, and maintaining barriers may not be worth the return in revenue."